Leaders from Canada’s aviation and aerospace sector in June 2018 gathered at Downsview Park in Toronto to celebrate investments made into what will become one of North America’s leading aerospace hubs. The event took place in a heritage aviation building that has been transformed into an aircraft cabin interior research facility of Ryerson University’s Aerospace Engineering program. Across the street sits Centennial College’s newly Downsview campus dedicated to aviation and aerospace. Scheduled to open in January 2019 as part of a $72 million investment, the college’s new four-acre campus will include approximately 138,000 square feet of instruction space and a new hangar large enough to accommodate today’s commercial jets. Chris Damaren, Director of the University of Toronto Institute for Aerospace Studies (UTIAS), then explained to attendees that UTIAS, recognized as one of the world’s leading aerospace research programs, is working on plans to establish facilities at the Downsview aerospace hub within the next few years. 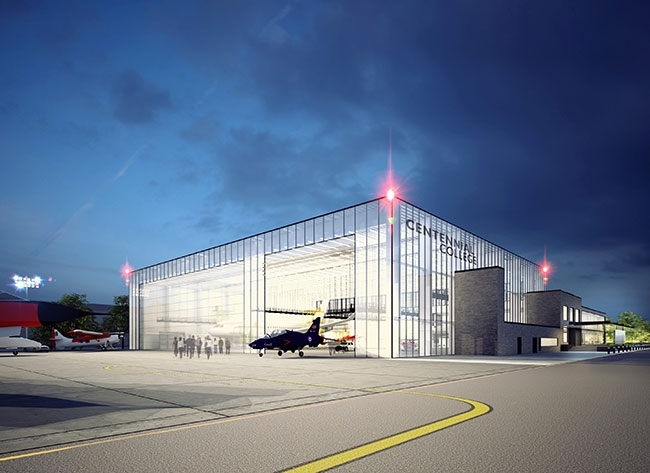 Development of the new Ontario aerospace hub is being led by the Downsview Aerospace Innovation and Research Consortium (DAIR). Francois Caza and Mike Nadolski of Bombardier began the event by reinforcing the company’s continuing commitment to the DAIR initiative. “Bombardier is investing in the continued growth and competitiveness of the province’s aerospace sector through multi-million-dollar contributions, research, training activities and by supporting the establishment of an aerospace hub in Toronto’s Downsview area,” said Caza, VP, product development and chief engineer, aerospace, Bombardier. Bombardier will provide $1.5 million over five years to fund core research at the Aeromaterials Research Centre, to be established at the DAIR Innovation Centre. As a founding member of the DAIR Consortium, Bombardier will also provide $900,000 over the next three years to support formal operations of the Innovation Centre. The centre will bring together industry and academic partners in a collaborative space for aerospace training and education, R&D, and sector advisory services. Bombardier will also contribute an aggregate $1 million over five years for the creation of two Aerospace Research Centres at Ryerson University and the University of Toronto. These centres will focus on research in the areas of advanced interiors and acoustics. The Canadian headquarters of de Havilland Aircraft of the United Kingdom was established at Downsview airfield just north of Toronto, whose brick buildings and hangars housed an assembly facility for the Moth training plane and the plywood Mosquito bomber. The long-dormant facility will become Centennial College’s fifth campus. The Centre for Aerospace and Aviation will be the new home of Centennial’s aerospace faculty, aircraft and related equipment relocated from Ashtonbee Campus in January. Centennial College is a founding member of the DAIR consortium, which also includes academic and industry partners like the University of Toronto Institute for Aerospace Studies, Ryerson University, York University, Bombardier, Safran Landing Systems, MDA and others.